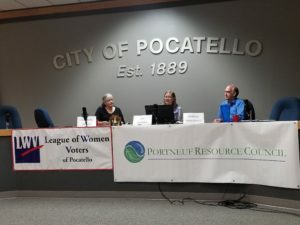 Portneuf Resource Council (PRC) and the Pocatello League of Women Voters co-sponsored a community forum entitled Are We Protecting Our Drinking Water? PRC member Shannon Ansley, Sue Skinner, PRC Environmental Policy Advisor, and Harold Hargraves, Pocatello City Water Operations Supervisor, spoke about Pocatello’s drinking water, where it comes from, how safe it is, and the threats to its quality in the future. An audience of over 50 people learned about the vulnerabilities of the aquifer, due in large part to the high number of homes on septic tanks. Both the county and the city were encouraged to follow recommendations of a Groundwater Protection Citizen Advisory Committee from 2011. The audience included four of the six Pocatello City Council members, representatives of the Idaho Department of Environmental Quality, and the Pocatello Director of Public Works/City Engineer, as well as two candidates for County Commissioner. PRC is committed to working with local governments to improve protection of the Portneuf valley’s water. The forum was recorded and is available on the Pocatello Community Media YouTube.